I’m presenting Story2Oh! tonight at CaseCamp. CaseCamp is a marketers-meet-technology forum in which four cases are presented and discussed. On tonight’s bill: TD bank, RedFlag Deals, a cool little YouTube project to help with Sick Kids fundraising and of course, my dirty little storytelling project. There are a bunch of rules for how to present to CaseCamp, the biggest being the fifteen minute time limit. I’ve been practicing my presentation with the egg timer and if I talk really fast and don’t pause to breathe, I’m okay. This’ll be the first time I bring Story2Oh! into the new media world, so it’ll be interesting to find out how they react. Actually, CaseCamp may be more of a marketing world, so I can test the idea of paying for this through product placement and advertiser sponsorship. If you’re not going to be in Toronto tonight to come, here’s what I’m going to say, only accompanied by spiffy slides created on Keynote. I’m going to introduce myself as a screenwriter who decided to experiment with storytelling on the internet. I’ll use my tried and true line about the early days of television when we used to film stage plays and then throw them up on the TV screen. It took us a while to learn how to use that medium. Right now, we’re in a similar place with the internet. We’re mostly condensing TV shows down to a few minutes and throwing them on the web. People watch, but it’s not a very good use of the medium. It’s going to take some experimentation to figure out how to effectively tell stories digitally. I don’t have the answers, but I have started asking some of the questions. I’ll introduce Ali Barrett and Simon Beals and I’ll screen the first video we posted. The next thing I’ll show is Ali’s first Facebook note and the kinds of comments she got. I didn’t know what would happen when we asked real people to comment on Ali’s fictional dilemma, but the audience was great; funny and creative. I’ll go through the many platforms we use in Story2Oh! : delicious, Twitter, Facebook walls, Flickr photo albums. 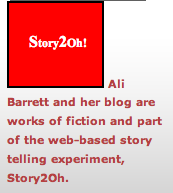 The next section of the presentation will look at some of the features of Story2Oh! that don’t involve storytelling so much as interacting with the audience. The characters play Scrabulous with their “friends”, write on their walls, participate in discussion forums and even comment on people’s blogs — and not necessarily about the story or themselves, they’ll engage you in conversations about you. We try to make it clear that this is a story and a form of entertainment. We mention that this is fiction on every profile and blog. We don’t mean to deceive anyone. We just want to tell you a story. Facebook, YouTube, MySpace, Flickr, Delicious, Digg, StumbleUpon, Ravelry, Daily Motion, Viddler, Bebo, Blip, FriendFeed, LiveJournal, Twitter, WordPress, MetaCafe, Revver, StupidVideos, Sk*rt, Vimeo, Crackle, Vodpod, Blogger and Pownce. What happened to Simon? I wanted to look more closely at his fictional life after I learned more about him at CaseCamp, but now it doesn’t seem like I can access his profile anymore. I hope this isn’t due to the controversy that was raised at CaseCamp because while the concern was valid… I think your idea was ingenious and could be leveraged by any number of TV networks wanting to promote their shows through social media. I really enjoyed the presentation and took some insights away from how you went about the experiment. It made me think that online stories are becoming non-linear – no central hub where content is housed (which is a good thing). It seems that the extensions, outlets and cross-platform nature of online story telling is now beocming the story in and of itself (Facebook, Twitter, YouTube). Very interesting stuff.